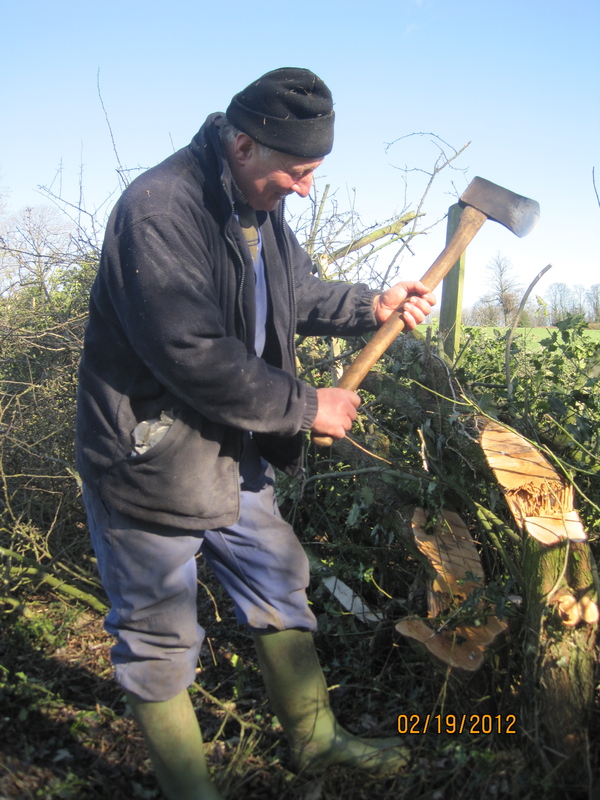 Gordon uses an axe to pleach a hedge. 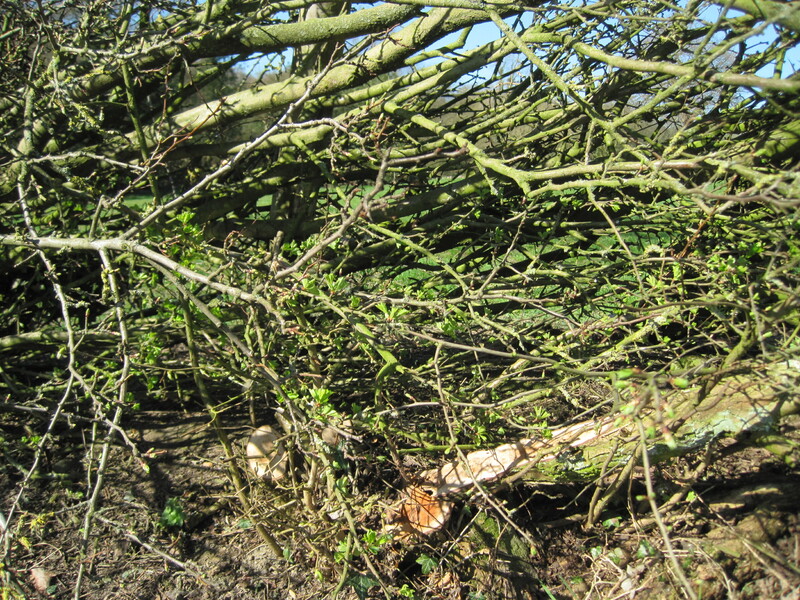 Last February, when I visited my cousins Gordon and Sue on their farm in the Peak District of Derbyshire, I saw a huge pile of cut branches in the middle of one of their fields and a neatly laid hedge along the side. Gordon had been pleaching. The farm badly needed some basic maintenance, so Gordon and his two sons, Tony and Ian, fixed up the farmhouse and barns so that they were habitable for people and animals, respectively, and then turned their attention to the land: in particular, a 15-foot-high, 300-foot-long hedge that probably hadn’t been touched in 30 years. It was a long, tall, unwieldy, straggly mess that needed to be tamed and brought under control: in short, it needed to be pleached. Pleaching is an age-old art, practiced in areas of the country where fields need boundaries, animals need to be enclosed, stones are few and hedges are plentiful. 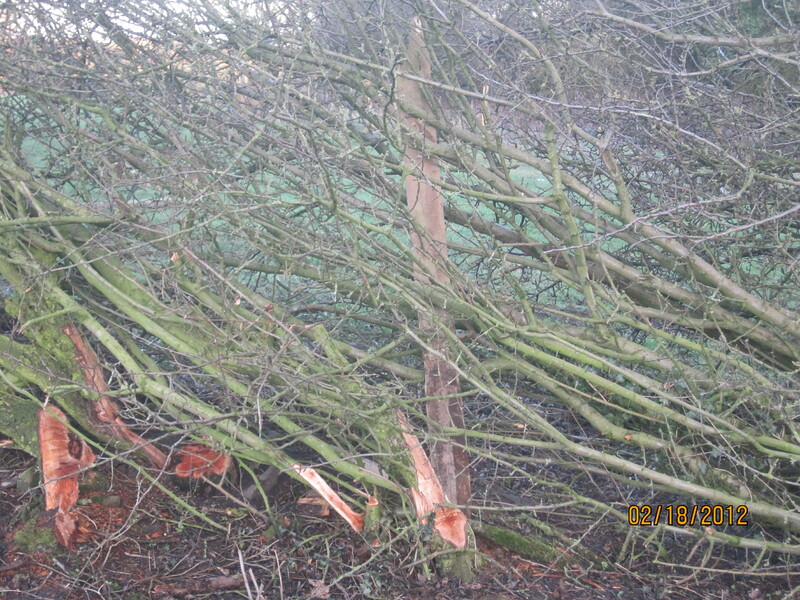 Pleaching a hedge means cutting young trees and bushes so that they can be bent to the horizontal or at a slight angle. The new growth then pushes through the old growth at a roughly 90-degree angle, ultimately forming a very strong hedge. “The first Bronze Age farmers had to clear woodland to make fields. On occasion, strips of woodland were left to mark the boundaries. These are our oldest hedgerows, and they are often on today’s parish boundaries. In 1993 it was estimated that about 204,000 miles of hedgerow remained in England. In our part of Derbyshire stone walls predominate, but there is still the occasional hedge, such as this one. Tools for pleaching include a chainsaw, an axe, and a bill hook, the last two wielded by hand, as they have been for centuries. 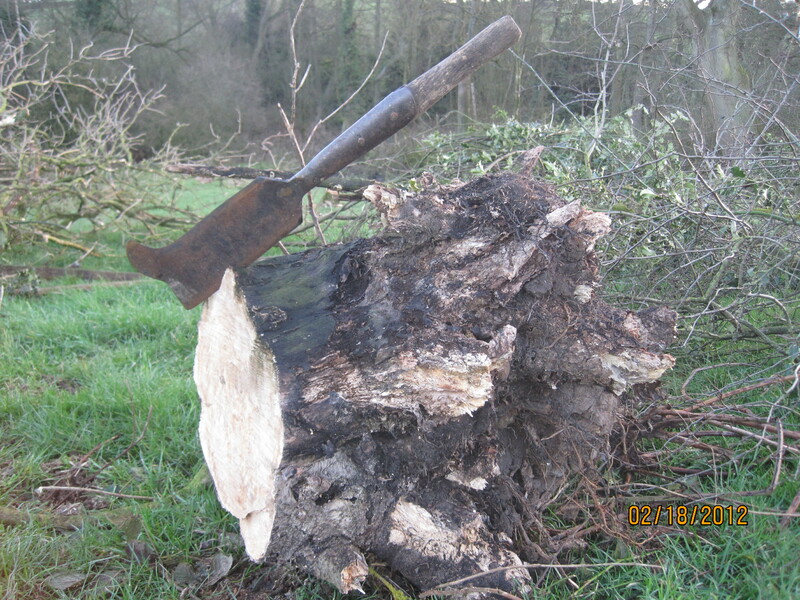 A bill hook used for pleaching. The bill hook, pronounced “billock,” which rhymes with “pillock” (British slang for a stupid or annoying person), is a tool that had its origins in medieval times when it was used as a weapon, similar to the halberd. Now it is used for pleaching. The first thing Gordon and his sons did was to cut out the excess branches that got in the way of creating the new hedge. 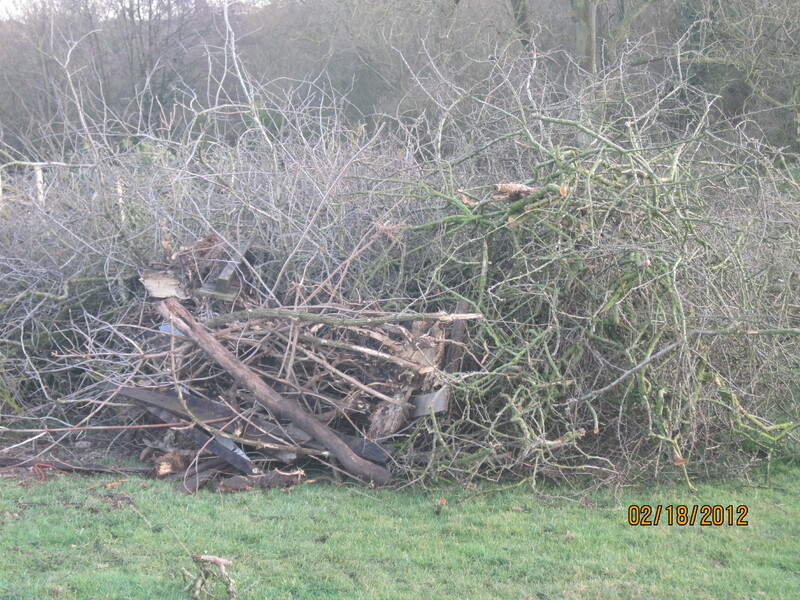 Obviously, they had a big job, judging by the huge pile of branches and trees in the field. 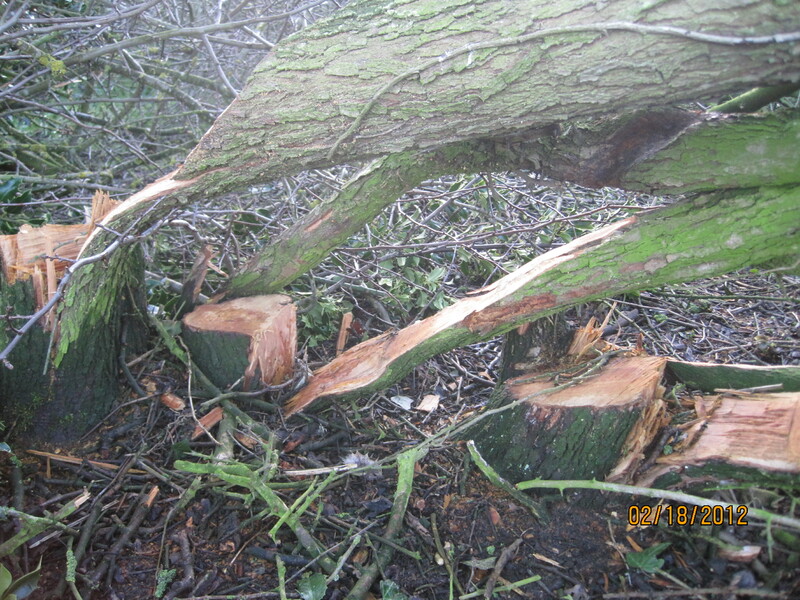 Tree trunks cut for pleaching. After he had done the cutting, Gordon laid the pleached trunks and branches at a 30-45 degree angle to the ground. In some cases, as in the hedge my grandfather pleached over seventy years ago, the branches are laid almost horizontally to the ground. Gordon’s field slopes downhill, so he started pleaching at the top of the hill, cutting the hedges on the downhill side and laying them uphill to keep the angle of the bend less than 90 degrees, which could further stress them and cause them to break off from the base. Hedges are laid facing uphill on downward-facing slopes. Pleaching is generally done every 15 or so years, so I was extremely lucky to be able to witness it, because at most it is done only five or six times a century on an individual hedge. Here’s what the finished hedge looked like. As seen below, stakes are installed at regular intervals to steady the newly cut hedge and keep it in place. I kept checking on the hedge throughout the spring, watching as it came back to life. In May, there were young shoots appearing on the branches. New growth on the pleached hedge. These new shoots will grow towards the sun, making their way through the old branches to create, over the years, a naturally interwoven, living enclosure for farm animals. 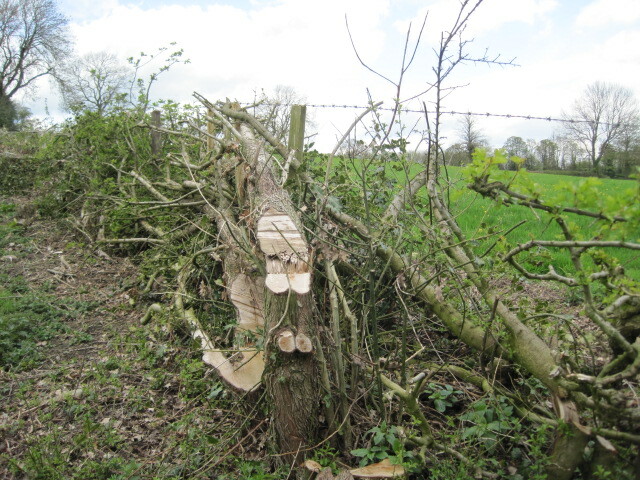 In addition, the hedge will provide a home for the 30 species of birds that typically nest in hedgerows: whitethroats, linnets, yellowhammers, dunnocks, willow warblers, wrens, robins, song thrushes, blackbirds, chaffinches, greenfinches, and partridges; animals such as toads, newts, rabbits, and foxes; and flowers such as lords and ladies, bluebells, foxgloves, and anemones. Pleached hedges, particularly those that are 800-900 years old, are wonderful reminders of the country’s history, a beautiful thing to behold, and a lovely aspect of the English countryside. Yes, Gordon and Sue are fantastic farmers, and great stewards of the countryside! Loved the pleaching article! Great text. Great photos. I learned a lot. Thank you for providing this information! I’m always happy to learn from the experts! I would say that what you describe so beautifully is layering, not pleaching, which is a technique for linking inosculate trees together to form a single organism. (Willow, hazel, apple, beech, lime – lots of native trees will take to pleaching.) You see endless miles of layered beech hedges in Somerset and Devon, beautifully maintained along single-track roads over the Brendon Hills, for example. Both techniques take great skill and have become a long-established part of the English landscape. Thank you for this information–I’d never heard the word layering used for this work, but it sounds reasonable. The word “pleaching” seems to have more common usage, but it may not be as exact. Thanks for writing.